This entry was posted in bath and body, bath products, free recipe, Natures Garden, soap, Soap making supplies, soap recipes and tagged animalistic instinct fragrance, animalistic instinct fragrance oil, animalistic instinct scent, animalistic instinct soap, cold process, cold process recipes, cold process soap, cp soap, cp soap recipes, Crafts, diy, free recipe, free soap recipe, good manly scents, homemade, homemade cold process soap, homemade soap, how can i make soap, how to make cold process soap, how to make soap, how to swirl soap, making cold process soap, making soap, manly soap, natures garden, soap, soap from scratch, soap making, soap making supplies, soap recipes, soaps, swirled soap, swirling soap, tiger print soap, tiger soap, tiger stripe soap, tiger swirl soap on March 30, 2015 by Deborah Ward. What inspires you? Well, here at Nature’s Garden, we are inspired by pretty much everything, but lately we’ve been on a serious animal print kick! 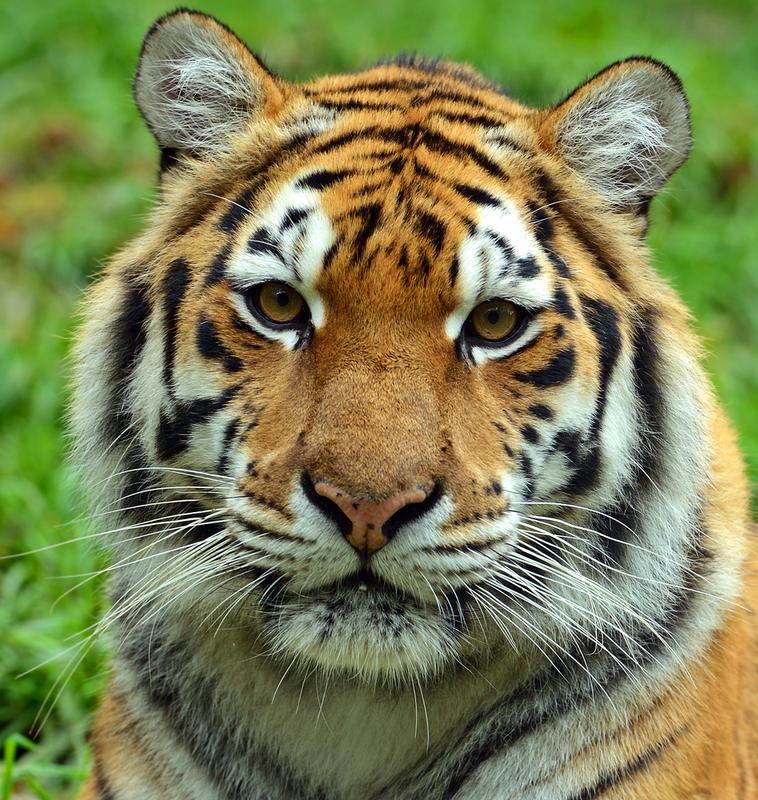 We found this amazing picture of this gorgeous tiger and couldn’t wait to get started on making a tiger stripe soap recipe! And we of course have used our Animalistic Instinct Fragrance, I mean how could we not? It’s absolutely perfect! Make sure to try out our amazing Animalistic Instinct scent! Always make sure to protect yourself first with your gloves, glasses, and mask! Then you can prepare your lye water. Weigh 345 grams of distilled water, and 125 grams of lye. Carefully pour your lye into your water. Never pour water into lye! This can cause an explosion! Thoroughly mix your lye water and then set it aside to cool down. Next, you can get your butters and oils ready. Weigh out 272 grams of Shea Butter, 272 grams of Olive Oil, 181 grams of Palm Oil, and 181 grams of Coconut Oil 76. Melt these down completely and then set them aside to cool as well. While you are waiting for both of these to cool, you can get your colors ready. In separate bowls, add 5 grams of Black Oxide colorant, and 7 grams of Neon Orange. Then in another bowl, measure out 15 grams of Titanium Dioxide, mixing this thoroughly with just a little bit of your oils from your base bowl until you have achieved a paste-like consistency. Make sure to keep checking your oils and lye water temperatures using your thermometer, until they have reached about 72 degrees Fahrenheit (room temperature) and are within ten degrees of each other. 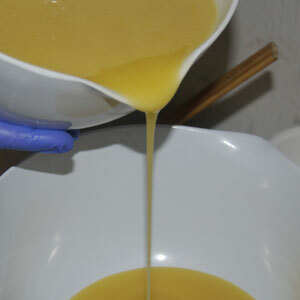 Then carefully pour your lye water into your butters and oils, mixing it together very thoroughly with a stick blender until you have come to a light trace. When your mixture is at a light trace, pour 400 grams into the bowl with black colorant, 500 into the orange, and 500 in a separate bowl, adding your titanium paste to this last bowl. Then thoroughly mix each color. Make sure to add 20 grams of your Animalistic Instinct fragrance to your black bowl, and 25 grams to the orange and white. Again, make sure to mix them thoroughly! 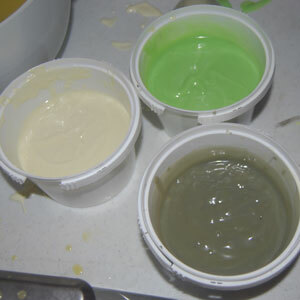 Once your colors are completely mixed, you can begin to pour them into your mold. 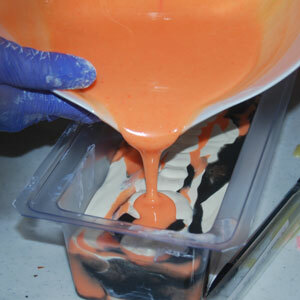 We started with our orange, carefully pouring just a little bit in a straight line all the way across the mold. 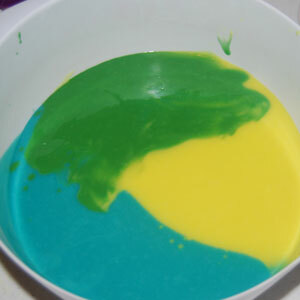 Then we alternated all three colors until the mold was almost full, leaving just a little bit of each color in our bowls. 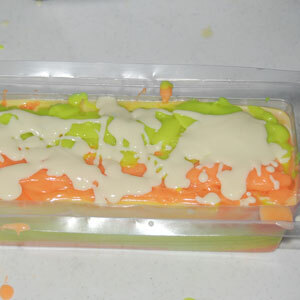 With the remaining colors, we splattered it over the top of the soap into gorgeous designs! Splatter the rest of your soap however your heart desires! 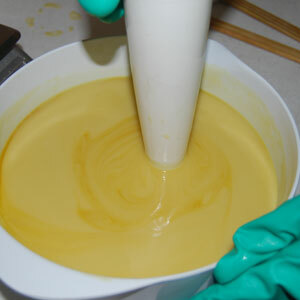 Once you have finished your soap, it will need to sit to set up for at least 24 hours before removing it from the mold. 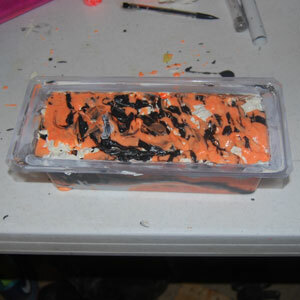 Once it is removed, your new Tiger Stripe Soap will need to sit for at least 4 to 6 weeks to give it enough time to cure and become less alkaline. After that, your soap will be ready for you to use and enjoy! Check out all the rest of our free recipes and classes and watch out for more Enlightened by Layla! This entry was posted in bath and body, free recipe, free soap recipes, Natures Garden, soap, Soap making supplies and tagged cold process soap, cp soap, Crafts, diy, free recipe, free soap recipe, help swirling soap, help with cold process soap, homemade, homemade soap, how do you make soap, how to make cold process soap, how to make soap, how to make tiger swirl soap, how to swirl soap, making cp soap, making soap, making tiger swirl soap, mint mango soap, mint mango tea fragrance oil, mint mango tea scent, natures garden, soap, soap making supplies, soap recipes, soap with swirls, soaps, swirled soap, swirling soap, tiger swirl soap on March 30, 2015 by Deborah Ward. I’m back everyone! 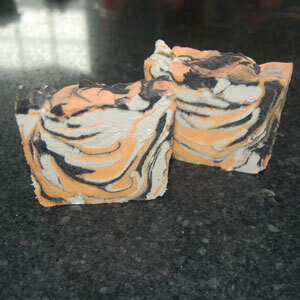 I finished my remake of my Tiger Swirl Soap, without adding any sodium lactate, and it turned out absolutely wonderful! Now we’re bringing you the great recipe for this beautiful soap, and it is the perfect one to bring you right into the spring season with its wonderfully bright colors! 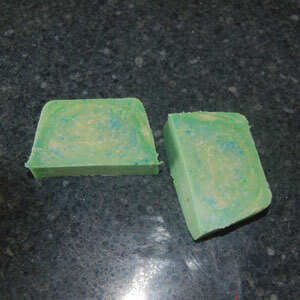 We have used our Shea Butter Cold Process Soap recipe for the base. Always start with safety first! Before preparing anything, make sure that you are wearing your safety glasses, gloves, and mask! Once you are protected, you can prepare your lye water. Measure and weigh out 345 grams of water. Then measure and weigh out 125 grams of lye. Carefully add your lye to your water, then mix together thoroughly. Set your lye aside to cool down. 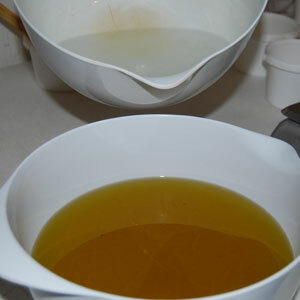 While you are waiting for the lye water to cool, you can go ahead and get your butters and oils ready. Measure and weigh out 272 grams of Shea Butter, 181 grams of Coconut Oil, 181 grams of Palm Oil, and 272 grams of Olive Oil. 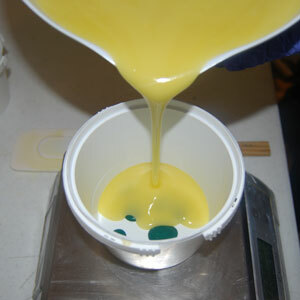 Then melt them your oils and butters down until they are completely melted. Once they are melted, set your bowl aside for it to cool as well. While you are waiting for both your lye water and oils to cool, you can get your colors ready. 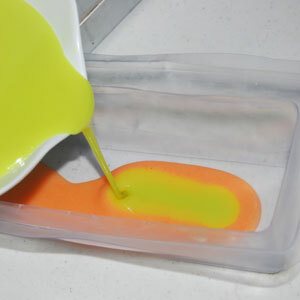 In one mixing bowl, measure and weigh out 4 grams of Neon Orange colorant, and 6 grams of Lime Green colorant into another. In a third bowl, measure and weigh out 15 grams of titanium dioxide. One your lye water and oils are around 100 degrees Fahrenheit and within 10 degrees of each other, they are ready to be mixed. 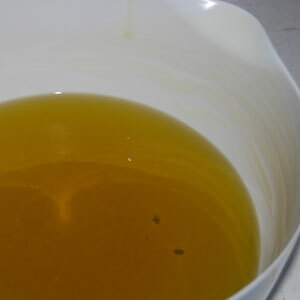 Then pour just a little bit of your cooled oils into the bowl with titanium dioxide. 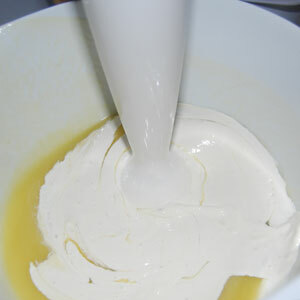 Mix it thoroughly until it has become a paste-like consistency. Then go ahead and pour your lye water into your butters and oils. Mix it together thoroughly. 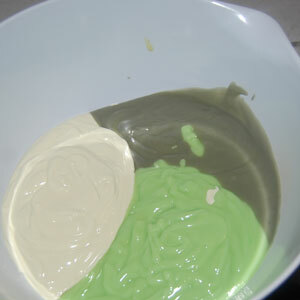 Next, pour 477 grams of your mixture into each bowl with your green and orange colorants. 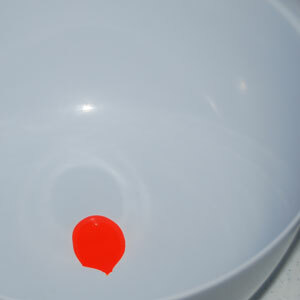 In the base bowl, add your titanium dioxide paste and mix thoroughly until your mixture has turned completely white. Then thoroughly mix your green and orange bowls until you have achieved an all over orange color and an all over green. Once you have thoroughly mixed your colors, add 24 grams of your Mint Mango Tea fragrance to each bowl, and again thoroughly mix each bowl. Then you can begin to pour your bowls into your mold. 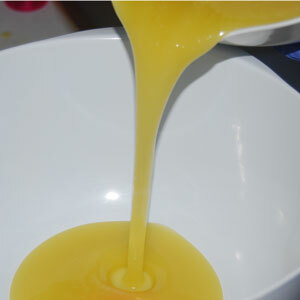 We started with our orange, and carefully poured just a little bit into a straight line across the mold. Do the same with your green, pouring into the center of the orange line. Same with the white, pouring it right into the middle of the orange. Keep doing this technique alternating your colors until you have almost filled your mold. Once you have finished pouring your colors, take the remainder of each and dollop it around on the top of your soap, using all of your remaining soap. 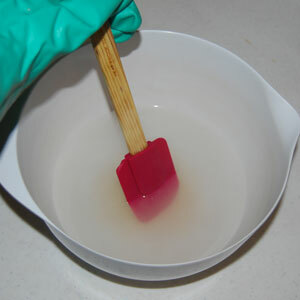 Then take your skewer and carefully circle it throughout the top of your soap, mixing the dollops together thoroughly. This will achieve a beautiful swirl effect on top. Make sure to let your soap sit for at least 24 hours to fully set up before removing it from your mold. Make sure to wait about 4 to 6 weeks before actually using your soap, giving it enough time to cure. After the 4 to 6 weeks have passed, your Mint Mango Soap will be ready for you to use and enjoy! Make sure to check out all the rest of our free recipes and classes as well! Keep watching for more Enlightened by Layla! This entry was posted in bath and body, bath products, free recipe, Natures Garden, soap, Soap making supplies, soap recipe and tagged aqua colored soap, aqua di gio soap, aqua di gio type fragrance oil, aqua di gio type scent, aqua soap, cold process soap, cold process soap recipes, cp soap, cp soap recipes, Crafts, diy, free recipe, free recipes, free soap recipe, good soap fragrances, help making soap, homemade, homemade soap, homemade soap recipes, how can i make soap, how to make cold process soap, how to make soap, how to swirl soap, in the pot swirl soap, making soap, natures garden, palm oil in soap, pot swirl soap, scents for soap, shea butter soap, shea butter soap recipe, smells like aqua di gio, soap making, soap making supplies, soap recipes on March 28, 2015 by Deborah Ward. What do you think of when you hear “Aqua di Gio?” Beautiful blue waters and hot summer nights maybe? And don’t forget about the hot man coming out of the crystal blue water. LOL! Well, here at Nature’s Garden, we’ve come up with the perfect soap recipe to capture the feeling of a romantic summer night spent with a man so hot it raises the temperature in the atmosphere! 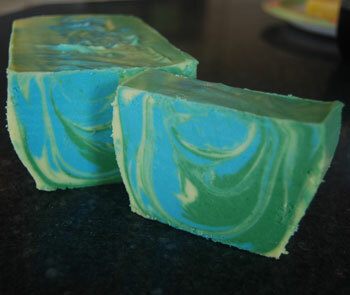 We’re introducing our new free recipe for our Aqua di Gio Soap! Safety first! Always make sure you are wearing your protective glasses, gloves, and mask! 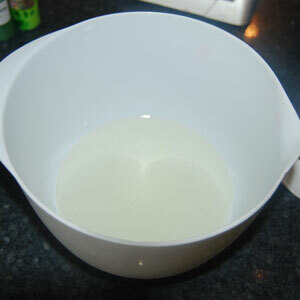 Then begin by preparing your lye water. Weigh out 345 grams of distilled water and then weigh out 125 grams of lye. Carefully add the lye to your water, never add water to lye as this can cause an explosion! Mix thoroughly and then set it aside to cool. While you’re waiting for that to cool, go ahead and prepare your butters and oils. Weigh out 272 grams of Shea Butter, 272 grams of Olive Oil, 181 grams of Palm Oil, and 181 grams of Coconut Oil. Melt them down completely and then set them aside to cool as well. As you are waiting for those to cool, go ahead and get your colors ready. 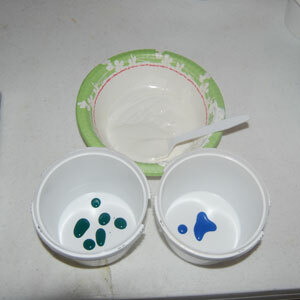 In two separate mixing bowls, measure out 6 drops of Neon Blue colorant and 7 drops of Teal. 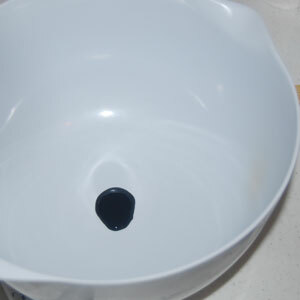 Then measure out 17 grams of Titanium Dioxide and pour just a little bit of your oils into the bowl with the titanium, mixing them together until you have achieved a paste-like consistency. This will be your color for your white swirl. Using the thermometer, check the temperatures of your oils and lye water until they have reached about room temperature (72 degrees Fahrenheit) and are within ten degrees of each other. Once they are at the correct temperature, pour 8 grams of Sodium Lactate into your lye water and mix it together thoroughly. 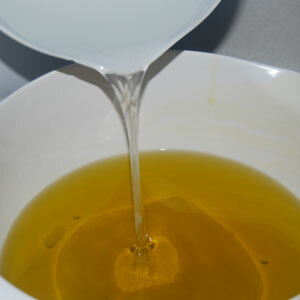 Then go ahead and carefully pour your lye water into your oils. Mix them together thoroughly. 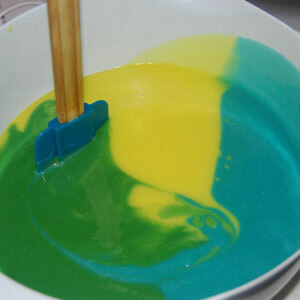 Then pour 459 grams of your mixture into the bowls with your colorants, mixing them thoroughly with a stick blender. 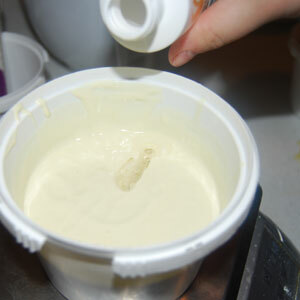 In your base bowl with the remaining mixture, add your titanium dioxide paste and mix. In each bowl, add 23 grams of your NG Aqua di Gio Type fragrance and stick blend. Next, in a separate bowl, pour each of your colors into separate sections of the bowl. Once they are completely poured, place a spatula at the edge of the bowl and drag it all the way across in a straight line. 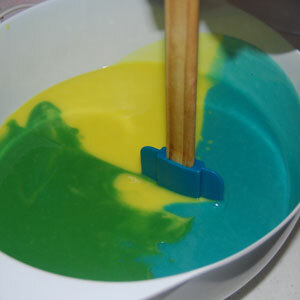 Then place the spatula right where two colors begin to mix and drag it around the bowl in a full circle. 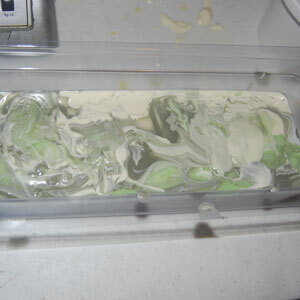 When you are finished swirling your soap, you can begin to pour it into your mold. 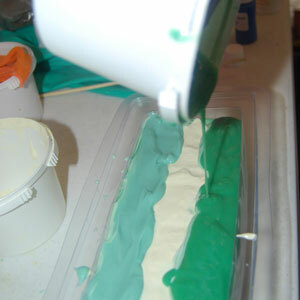 Carefully pour it from side to side in the mold, helping to achieve an even better swirl! 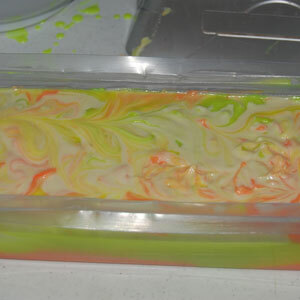 Make sure to leave just a little bit of each color so that you can swirl the top of your soap! 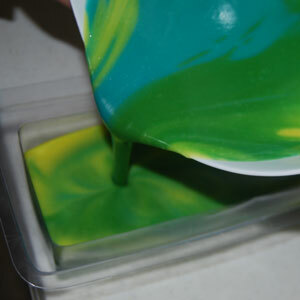 Taking the last of your colored soap, pour each color in a straight line across the top. 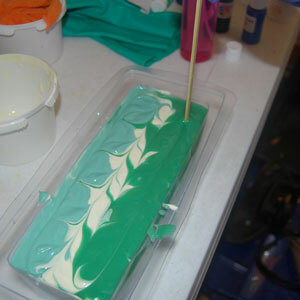 Then with your skewer, swirl the top of your soap! 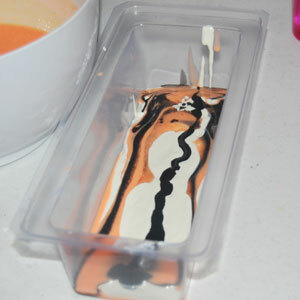 Make sure to let your soap sit for at least 24 hours before removing it from the mold. Once it has been removed from the mold, your new Aqua di Gio Soap will need to sit for at least 4 to 6 weeks before using; giving it enough time to cure and become less alkaline. Then it is ready for you to use and enjoy! Make sure to check out all the rest of our free recipes and classes as well, and keep watching for more Enlightened by Layla! This entry was posted in bath and body, free recipe, Natures Garden, soap, Soap making supplies, soap recipes and tagged bath and body, bath and body products, cold process, cold process soap, cp soap, cp soap recipes, Crafts, diy, free recipe, free soap recipe, homemade, homemade bath and body products, homemade soap, how can i make soap, how to make cold process soap, how to make soap, how to swirl soap, in the pot swirl, in the pot swirl soap, making soap, natures garden, scent of spearmint, smells like spearmint, soap, soap making, soap making supplies, soap recipes, spearmint, spearmint fragrance, spearmint scent, spearmint soap, swirled soap on March 26, 2015 by Deborah Ward. Doesn’t the scent of spearmint just completely delight you? I know it’s an aroma that can instantly lift my spirits! This is one scent that everyone you know is sure to adore, and one that you can easily fill your home with! 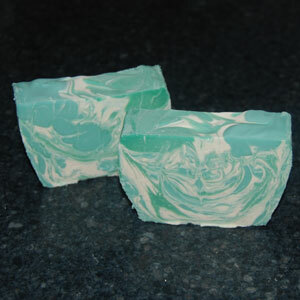 We’re bringing you a brand new free recipe, and it is for our beautiful new Spearmint Soap! Doesn’t this amazing combination of green, gray, and white just make you extremely happy? 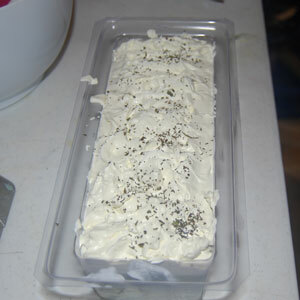 We have used our Shea Butter Soap Recipe for the base. Always start with safety first! Make sure you are wearing your safety glasses, gloves, and mask! Once you are protected, you can prepare your lye water. Measure and weigh out 345 grams of distilled water. 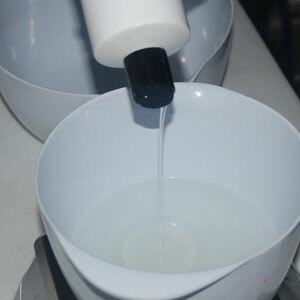 Then measure and weigh out 125 grams of lye, and add it to your water. Always add lye to water, never add water to lye as this can cause an explosion! Mix your lye water together thoroughly, and then set it aside to cool down. While you are waiting for your lye water to cool, you can get your oils and butters ready. Measure and weigh out 272 grams of Olive Oil, 181 grams of Palm Oil, 272 grams of Shea Butter, and 181 grams of Coconut Oil. Then completely melt these down, and set them aside to cool as well. As you’re waiting for your butters and oils and lye water to cool, you can prepare your colorants. 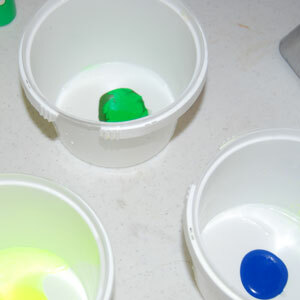 In separate mixing bowls, add 4 drops of Neon Green colorant to one, and 2 drops of Black Oxide to another. Then measure and weigh out 8 grams of Titanium Dioxide in a bowl and pour just a little bit of your oils into it. Mix it together until it has become a paste-like consistency. This will be for your white swirl. For your white top, in a separate bowl, measure and weigh out 22 grams of Titanium Dioxide and pour a little bit of your oils, again making a paste-like consistency. Using your thermometer, keep checking the temperatures of your lye water and oils until they have reached around room temperature (72 degrees Fahrenheit) and are within ten degrees of each other. 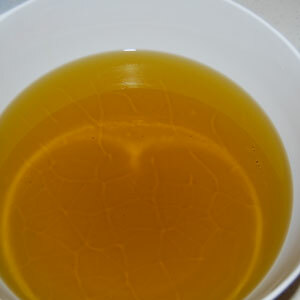 Then carefully pour your lye water into your oils, and thoroughly mix them until they have come to a light trace. After you have come to trace, pour 461 grams of your mixture into a another mixing bowl and add your Titanium Dioxide paste with 22 grams. 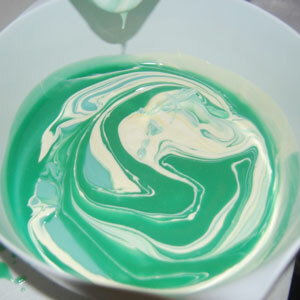 Mix it thoroughly and then add 23 grams of Spearmint fragrance, once again thoroughly mixing. Then set this bowl aside to let it sit and set up to become your topping. 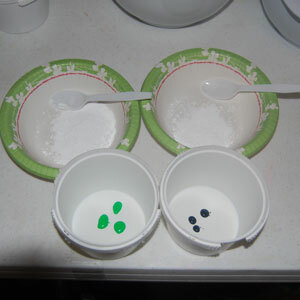 Next, into the bowls with your green and black colorants, add 308 grams of your mixture to each. In a third bowl, add 308 grams of your mix and add your white paste with the 8 grams of Titanium Dioxide. Thoroughly mix these together until you have achieved an all over gray color, all over mint green, and an all over white. Add 15 grams of your Spearmint fragrance to each of these and mix them together thoroughly. 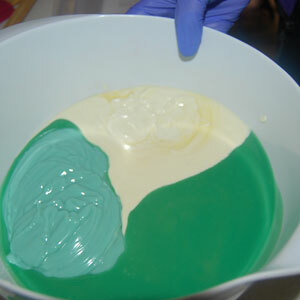 Then using the in the pot swirl method in another bowl, pour each of your three colors into the bowl. pouring each into a separate section. Using a spatula, start at the edge of the bowl and drag it in a straight line all the way across. 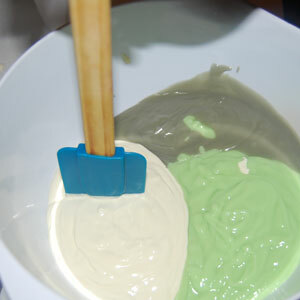 Then place the spatula right where two colors begin to mix and drag it in a full circle around the bowl. 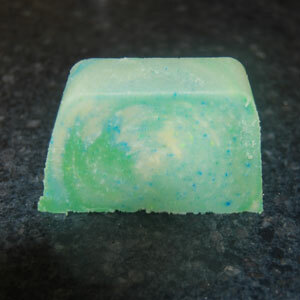 After you have swirled your soap, you can begin to pour it into your mold. If you carefully pour it from side to side using the “granny pour” method, this will help you achieve an even prettier swirl! Once your soap is completely poured, make sure your topping is set up to about the consistency of cake frosting and then pour it on top of your soap. You can peak it with your spatula. 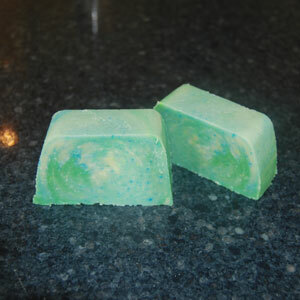 After all of your topping is on your soap, lightly sprinkle some Spearmint leaves over top! Once your soap is finished, you will need to let it sit to set up for at least 24 hours before removing it from your mold. Once it is removed, let your soap sit for at least 4 to 6 weeks, giving it enough time to fully cure and become less alkaline. Be sure to check out all the rest of our wonderful free recipes and classes, and keep watching for more Enlightened by Layla! This entry was posted in bath and body, bath products, free recipe, Natures Garden, soap, Soap making supplies and tagged cold process soap, colored soaps, coloring swirl soap, cp soap, cp soap recipes, Crafts, diy, free recipe, free soap recipe, homemade, homemade soap, how can i make soap, how to make cold process soap, how to make soap, how to make swirl soap, how to make swirled soap, how to swirl cold process soap, how to swirl soap, making cold process soap, making cp soap, making in the pot swirl soap, making soap, making your own soap, natures garden, natures garden soap, soap, soap making, soap making supplies, soap recipes, swirl cold process soap, swirl soap on March 20, 2015 by Deborah Ward. Hello everyone, I’m back with my fixed Nature’s Garden’s colors soap! And I’m even bringing you the easy free recipe so you can make it yourself! 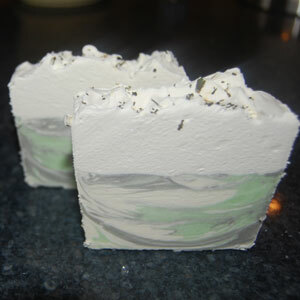 For this recipe, I have used our recipe for our Shea Butter Cold Process Soap. Learning from the mistakes I made the first time, I made sure to thoroughly mix my colors as well as bringing my colors to trace. This soap has turned out so beautifully and I am so excited! I also added more color to make the colors even brighter! Always start with safety first, especially when working with lye as it can cause burns when it comes in contact with your skin! Make sure to wear your safety glasses and gloves! Once you are protected, you can go ahead and prepare your lye water. 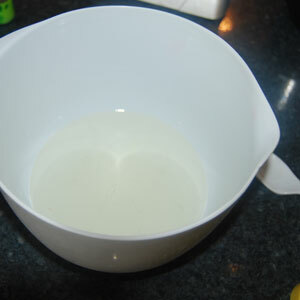 Measure and weigh out 345 grams of water into a mixing bowl. When making your lye water, always remember to pour your lye into your water, not water into lye as this can cause an explosion! Weigh out 125 grams of lye, pour it into your water, and mix it together thoroughly. Let your lye water sit to cool down. While your lye is cooling, you can get your oils ready. In a mixing bowl, measure out and weigh out 272 grams of Shea Butter, 181 grams of Palm Oil, 181 grams of Coconut Oil, and 272 grams of Olive Oil. When you have all of your oils ready, go ahead and melt them down completely. Then let them sit to cool as well. While you are waiting for your oils and lye to cool, you can get your colors ready. Using three separate mixing bowls, add 6 grams of Yelp Yellow colorant to one, 4 grams of Kelly Green and 5 grams of Neon Green to another, and 7 grams of Neon Blue to the last. Using your thermometer, check the temperature of both your lye as well as your oils. Once they are both around 72 degrees (room temperature) or so and the temperatures are within 10 degrees of each other Fahrenheit, you can pour your lye water into your oils. Soaping at this lower temperature will give you a lot more time to work. Using your stick blender, thoroughly blend it together until you have completely emulsified it and have brought it to a light trace. 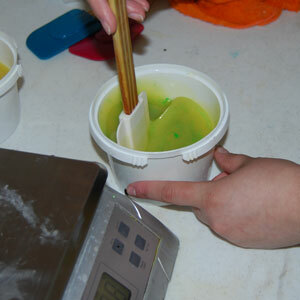 Then go ahead and pour 459 grams of your soap into each bowl with your colorants. Add 37 grams of fragrance to each bowl. Thoroughly mix each bowl until you have achieved an all over green color, blue, and a bright yellow! 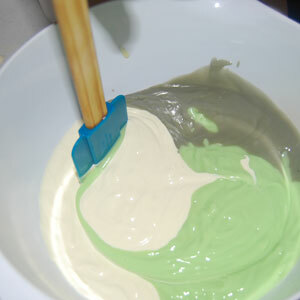 Once your colors are mixed, you can begin to pour them into a clean mixing bowl. Pour each color in separate sections of the bowl. Using a spatula, starting at the edge of the bowl, drag it in a straight line all the way across. After you have done the straight line, place the spatula right where two colors begin to mix and drag it around your bowl in a circle. 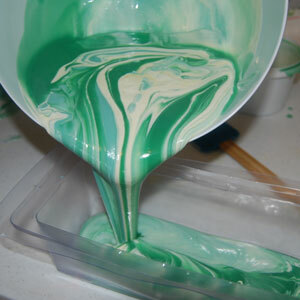 Once you have finished swirling your soap, you can begin to pour it into your mold. Carefully, and slowly pouring it from side to side in the mold using the “granny pour” (as we call it) will help you achieve an even prettier swirl. 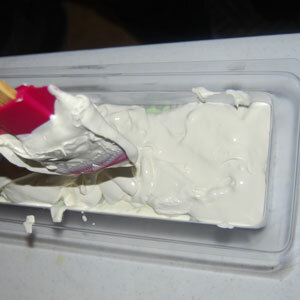 Once it is all poured, you will need to let your soap sit for about 24 hours. After the 24 hours, you can remove your soap from your molds and slice. We like to allow our cold process soap to cure for about 4 weeks to allow it to become harder and less alkaline. Make sure to check out all the rest of our free recipes and classes as well! Keep watching for more Enlightened by Layla! This entry was posted in bath and body, bath products, cold process soap, Natures Garden, soap, Soap making supplies and tagged are there problems with swirl soap, cold process soap, cp soap, Crafts, diy, help swirling soap, help with cold process soap, help with soap making, homemade, how can i swirl soap, how to make cold process soap, how to make soap, how to swirl soap, in the pot swirl soap, in the pot swirl soap problems, making cold process soap, making cp soap, natures garden, problems swirling soap, problems with in the pot swirl soap, problems with soap coloring, problems with soap making, problems with swirl soap, soap making, soap making problems, soap making supplies, swirl soap problems on March 19, 2015 by Deborah Ward. 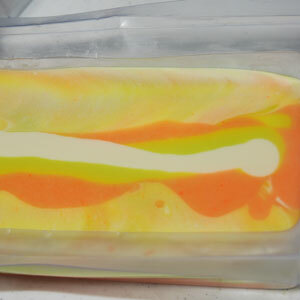 I have recently been experimenting with making all kinds of soap, but I had quite a few problems making my first batch of in-the-pot swirl cold process soap. 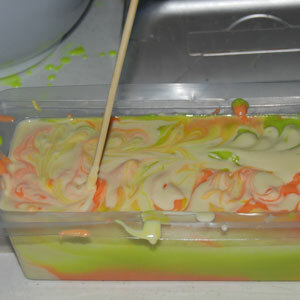 I was attempting to make a soap with the signature colors of Nature’s Garden swirled into it. Wouldn’t that be so cool? We thought so, and I was so excited to try it out! However, as I’m still a newbie to the soap making process, I had quite a few problems! One of the first problems I had was getting my colors to thoroughly disperse in my soap mixture. After having completely mixed the oils and butters with my lye water and pouring into separate bowls to mix colors, I was having problems with getting my colors mixed thoroughly. Especially the blue. As you can see in the picture below, my blue pigment ended up not mixing completely, which left little blue speckles throughout my finished soap. This is possibly caused by the color separating within its bottle. Do you know what to do if this happens to you? Deb has taught me that if I notice my color has separated, that it can be fixed by mixing it with vegetable glycerin and agitating. See all the blue speckles? 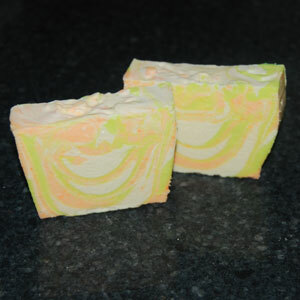 One of my other swirl soap problems was that I did not mix my colored soap batters long enough. While this does coincide with not mixing my blue thoroughly, it did cause a completely different problem apart from the speckles. When the colored batters were still in their separate containers, I should have kept mixing them until they came to a slight trace. (Trace happens when the batter has begun to thicken. If you hold your spoon or mixer over your bowl with some batter still on and it leaves little trails on top, then it is at trace.) 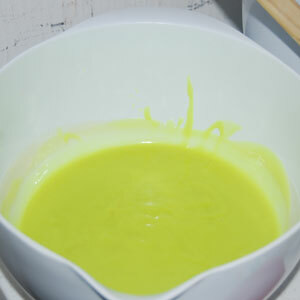 Instead of bringing each colored bowl to trace, I only brought them to the emulsification stage. This caused my colors to dissolve into each other while they were in the mold instead of producing an actual distinctive swirl. There should have been a swirl instead of how the colors have just blended into each other here. I would love to hear about any problems you’ve had with in the pot swirl technique, or just soap making in general! I’m just a newbie at this, so I am actually glad that I have been having these problems so I can learn from them! Soap making is so much fun! I’m getting ready to remake this recipe so I’ll be back to let you all know what happens! Please contact us here at Nature’s Garden if you have any thoughts, questions, or concerns! Make sure to check out all of our wonderful free recipes and classes, you’re sure to find some awesome recipes that you’ll absolutely adore! And our classes are perfect for any new soap makers out there like myself, I highly recommend reading through them all, as you can learn so many valuable things about soap making! I’d love to hear all of your feedback on any soap making problems so that I can learn from them as well! 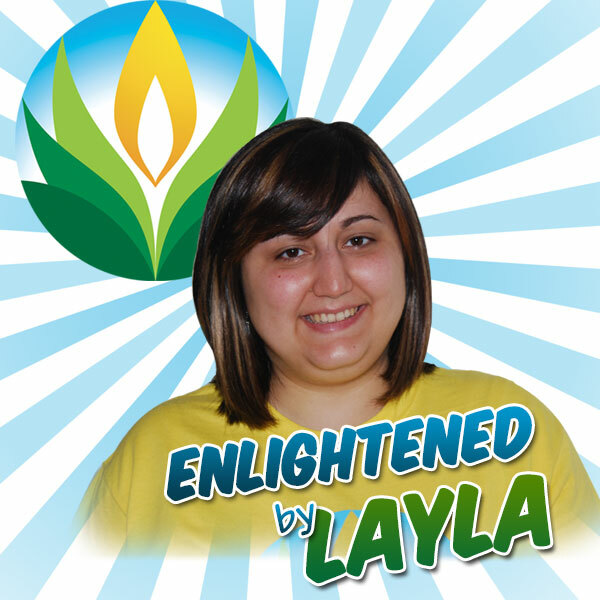 Keep watching for even more Enlightened by Layla!